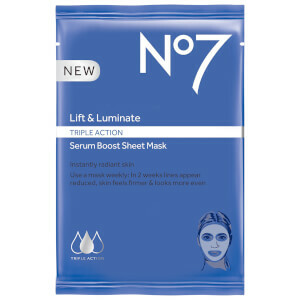 Treat your skin to the anti-aging benefits of the Boots No.7 Restore and Renew Sheet Mask, a revitalizing treatment that delivers 7x the concentration of actives in just 20 minutes. The face mask is infused with a potent serum of Hyaluronic Acid, Calcium and Amino Acids, which work to smooth out wrinkles, brighten the skin tone and plump the facial contours. Expect visibly youthful and glowing results. Prepare - Fasten hair away from your face. Cleanse & dry your skin before use. Tear open the sachet & carefully remove & unfold the mask. Apply - Fit the mask around the eyes. Smooth into place across the forehead, then down across the nose, cheeks & around your mouth. Hook the face section over ears, then stretch the chin section under your chin & also hook over ears to secure. Finally, smooth the lower section around your neck & relax for 15-20 minutes. Remove - Carefully remove the mask & discard. No need to rinse, instead gently massage any remaining essence into the skin until absorbed. Aqua (Water), Dipropylene Glycol, Glycerin, Betaine, Butylene Glycol, 1,2-Hexanediol, Polyglyceryl-10 Laurate, Hydroxyacetophenone, Panthenol, Ammonium Acryloyldimethyltaurate/Beheneth-25 Methacrylate Crosspolymer, Pentylene Glycol, Sophora Angustifolia Root Extract, Hydroxypropyl Cyclodextrin, 3-O-Ethyl Ascorbic Acid, Sodium Hyaluronate, Parfum (Fragrance), Carbomer, Retinyl Palmitate, Sorbitan Laurate, Polysorbate 20, Sodium Lactate, 3-Aminopropane Sulfonic Acid, Calcium Hydroxymethionine, Disodium EDTA, Hydroxyethylcellulose, Tromethamine, Acetyl Dipeptide-1 Cetyl Ester, Palmitoyl Tripeptide-1, Palmitoyl Tetrapeptide-7.